As well as clearing up spots/acne prone skin thanks to its anti bacteria properties you could use this as quick face mask, apply honey straight on to your face for ten to fifteen minutes twice a week and I think you will notice a huge difference in your skin, cheaper than most high street brands and its all natural! Who else get those nasty lumps and bumps after shaving? I know I have in the past but since using honey straight after shaving I have noticed a massive difference in my skin, no nasty lumps where there not needed and super soft legs! Honey is also known for strengthening your nails and soften your cuticles, if you would like to make your own home made nail strengthener all you need is a tsp of honey and a tsp of apple cider vinegar, apply this to your nails and cuticles for ten minutes and rinse off, again I would say do this twice a week to notice a difference. 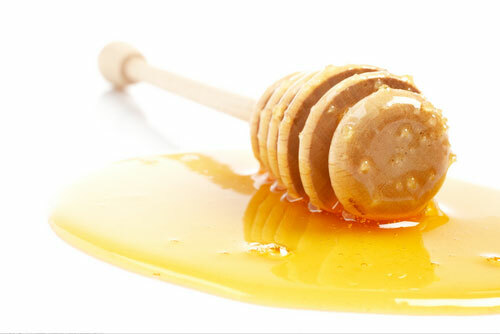 Honey has a natural bleaching effect so it can be used to lighten your hair and for helping to clear up scars! If your wanting to clear up unwanted scars pop honey on the affected area daily to see a difference and to gradually lighten your hair naturally all you need to do, is mix 1 tbsp of honey with 6 tbsp of distilled water and apply it to your hair for one hour and do this once a week, to speed up the process add 1 tsp of cinnamon powder. If your not one for shaving your legs and nether regions and prefer to wax, honey when mixed with lemon juice and sugar make a great home made hair removal system. Mix 1 tbsp of honey with 3 tbsp of brown sugar and one tsp of lemon juice, boil these ingredients in the microwave until they bubble and the mixture turns brown, allow it too cool a little and with the help of a lollipop stick or something similar apply the mixture to your designated area and place a cotton strip on the mixture once it has been on that area for a good few seconds then gently pull the cotton strip against the direction of hair growth, you should have super smooth skin! I hope this helped you in some way and gave you some inspiration to try out some of the tips just using a natural product, sometimes its just fun to play around with new things too.